NMW enforcement: has BIS kissed goodbye to £4m in financial penalties? 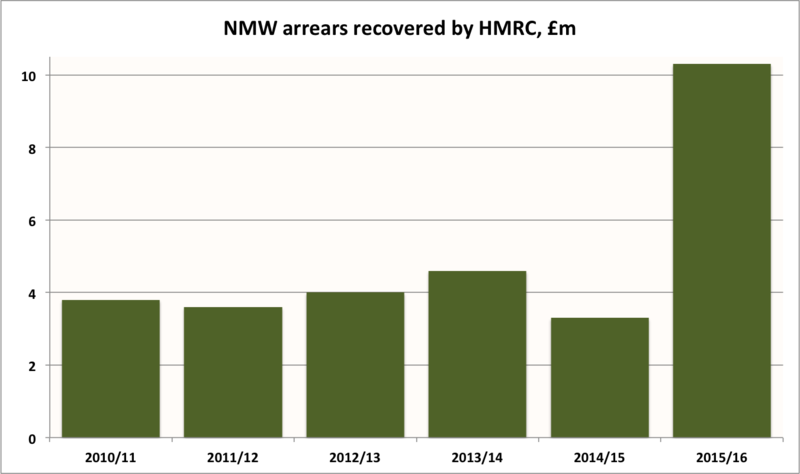 As noted on this blog in February, something very unusual went on with enforcement of the national minimum wage (NMW) in 2015/16, with both the total amount of NMW arrears recovered by HMRC and the number of workers benefiting from that recovery being way up on previous years. Last month, BIS minister Nick Boles indicated that “more than £10 million” of arrears were recovered – up from £3.3m in 2014/15, and an average of £3.8m in recent years – for some 58,000 workers, more than double the 26,318 who benefited from HMRC enforcement action in 2014/15. And this week – in his answer to a parliamentary question by Caroline Lucas MP – the minister confirmed that £10.3m was recovered from a total of 958 employers. The Employment Act 2008 amended the National Minimum Wage Act 1998 to replace enforcement and penalty notices with a single Notice of Underpayment. These changes came into effect on 6 April 2009. Except in exceptional circumstances, a Notice of Underpayment should be issued in all cases where a compliance officer finds that arrears of minimum wage were outstanding at the start of an investigation. The reasons for the underpayment should not be taken into account when determining whether or not to issue a Notice of Underpayment. Notices should be issued in all cases where arrears are outstanding at the start of an investigation, notwithstanding that the employer claims that the underpayment of minimum wage was accidental. And could it be that those 145 amnestied employers account for much of that £7m increase in arrears recovered, relative to 2014/15? That 212% increase is not easily explained by the 43% increase in the HMRC enforcement team’s budget (£9.2m to £13.2m) and associated 47% increase in FTE staff (183 to 269), as the number of closed cases increased by only 21%, from 2,204 to 2,667. So, let’s (very generously) assume that £1.3m (40% of £3.3m) of that £7m increase is simply due to increased enforcement activity. We also know that one of the 813 employers who were issued with a Notice of Underpayment – security firm TSS (Total Security Services) Ltd – was found to owe a whopping £1.7m of arrears (we know, because the firm was ‘named & shamed’ by BIS in early February). That case is truly exceptional – £1.7m is 613 times the average arrears of£2,770 owed by the other 489 NMW rogues ‘named & shamed’ by BIS to date. That leaves some £4m (or possibly more, if my above assumption is over-generous) of unexplained, excess arrears. And, if I’m right that that £4m or more was ‘recovered’ from the 145 employers who seemingly took advantage of the BIS amnesty, that means those 145 employers evaded some £4m or more in financial penalties. Lucky them. (And, if you think £4m doesn’t sound very much, bear in mind that the total amount of penalties issued over the past four years is just £4.2m). In 2015, HMRC also introduced ‘self correction’ where, following an intervention from HMRC, employers are required to self-correct underpayments of the National Minimum Wage. Since 1 April 2015, 177 employers have notified self-corrected arrears, identifying £4,614,929 for 22,607 workers. The employers are in the process of repaying this money to workers and ex-workers. HMRC is also responsible for checking that these arrears have been paid. Is that the BIS amnesty? It’s not clear. But the NAO’s £4.6m is not a million miles away from my ‘£4m or more’, even if there is no obvious explanation for the difference between the NAO’s ‘177 employers’ and the figure of 145 given in the minister’s answer to the PQ by Caroline Lucas. Perhaps it’s about time someone in BIS did some explaining? Update (2 June): Well, I was wrong. Yes, you read that right. According to the answer BIS has given this week to a further parliamentary question by Caroline Lucas MP, the 6-month amnesty for NMW-breaching employers announced by BIS in July 2015 does not explain more than a small part of the remarkable increase in arrears recovered in 2015/16. 60 employers took advantage of the amnesty, but they owed only some £786K in arrears to some 4,800 workers. However … that still leaves another 85 employers (145 – 60) that BIS says were not issued with a Notice of Underpayment, so were not issued with a financial penalty. And BIS seems reluctant to say how much of the £10.3m was recovered from those 85 employers. Watch this space. 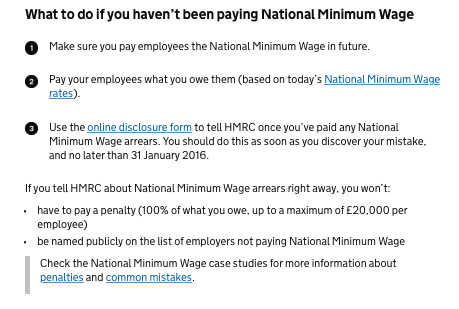 This entry was posted in Workers' rights and tagged Enforcement, HMRC, Minimum Wage, NMW. Bookmark the permalink.